New Republic - "Inside BlazerCon, the Nerdiest Sports Convention in the U.S."
"But no matter their club, these fans were serious about their love. They had to be, considering the cheapest BlazerCon tickets cost $225. (The VIP tickets set you back $425.) Unsurprisingly, the fans at this sold-out event were overwhelmingly white men, a demographic showing that strikes at the heart of the cultural divide in American soccer fandom. Men in Blazers, like NBC and FOX, are chasing typically white upper-middle class viewers who will buy their cable packages and turn up at pubs to watch their matches over pints of Guinness. BlazerCon didn’t take into account the millions of American soccer fans who don’t fit this demographic. The MLS, for instance, has far and away the largest share of Hispanic viewers of any American sport: 34 percent to the NBA’s 12 percent. Nearly 40 percent of MLS fans make less than $40,000 a year. Despite the Premier League’s rising popularity, Univision’s broadcast of the Mexican league in the U.S. outperforms NBC’s coverage of the English league by 15 percent each season. 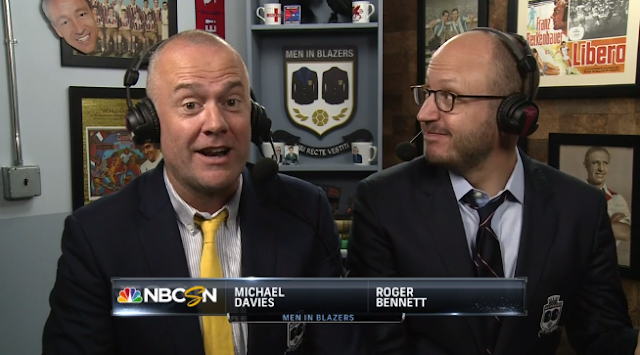 These people were not at BlazerCon, and they would hardly consider Davies and Bennett the great saviors of American soccer culture."